Garage opener can make it easier to open and close the garage door, and an automated garage door, that open and close whenever we need it to, with just pressing the button of the remote control, can really improve the life quality. There are many options when it comes to garage door operators, from belt drive openers, to chain drive openers, you have a variety of options to choose from. We won’t get into the debate which company is the best garage door operators manufactures, but we can say that just like with the garage door itself, the difference between a high quality garage door operator will last for many years (depend on the frequency of using it and the maintenance), and the difference between a high quality opener, to a basic one, can be few dollars, and we recommend that you won’t let that stop you from purchasing a high quality opener that will serve you for many years.If you are looking for a new garage door installation, opener installation or garage door replacement in La Verne, contact us, and we will help you to find the right garage door for you.A broken garage door does not mean that it is time to get a new garage door. There are many possibilities that can lead to a garage door that does not work smoothly: from a broken spring, through a garage door opener problem, to a broken panel; we can help! Ken Davidson Garage Doors specialize in all kinds of garage door repair in La Verne. Whether you need a residential garage door repair, or a commercial garage door, you got to the right place. Our garage door company in La Verne, have years of experience at the garage doors repair field. 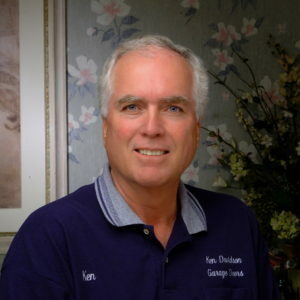 All our technicians are licensed and professional, and will always do the best they can to provide you with the best garage door service, like they did many times before.We, at Ken Davidson Garage Doors, believe that a good garage door repair job start from understanding the problem, and the cause to it. Every garage door, that was correctly installed, by a professional garage doors technicians, using the best garage door parts, should work perfectly for years, as long a maintenance job was performed about every 6 months. So in order to avoid problems with the smooth way every garage door should work, we recommend to perform a maintenance job every 6 months. If you think that your garage door in La Verne may have a problem, and you are not sure about it, please call us, and we will be happy to assist you free of charge. Do not ignore the problem, even if it is only a noisy garage door, a small problem will always grow to a bigger one, and the garage door repair that you will eventually need will cost you much more time and money.So if you have a garage door in La Verne that need a repair, and you are looking for a reliable garage door company, look no farther! Call us, and we will do our best to provide you with the service that made us so famous.From commercial garage door repair, to residential garage door replacement, you got to the right place. After years of experience in the garage door repair field, we are proud to say that there is no garage door project which is too small or too big for us. Our team of garage doors technicians have successfully performed hundreds of garage door repair in La Verne, and will always do their best, providing you the best repair service, and always for a fair price! Please know, that a broken garage door spring is dangerous, and a garage door with a broken spring – whether it is a torsion spring system, or extension spring system, should not be used. We fix broken overhead doors springs. We have the knowledge and the experience to fit the right spring for the right garage door. We also install safety cables for extension springs. Those cables are there in case one of the garage door springs will break. In that case, the safety cables will try to minimize the damage that a broken spring, which is under a lot of tension can cause. You should know that not every garage door spring will fit any garage door. Many calculations were made, to fit the right spring for the overhead door, and using the wrong spring will end with a door that doesn’t work, and can even be dangerous. Whether it is a garage door in La Verne, or a broken garage door spring repair near La Verne, stop using the door until a garage door tech will replace the broken spring. If your garage door is automated, and your garage door motor (Opener) is not working like it used to work, it does not always meant that the reason for that is a problem with the opener. As we explained in this article, the most lifting and lowering power is not coming from the opener but from the spring system. If one of the springs is broken, lose, or not adjust, it mean that the spring system isn’t doing its part in the lifting, and the opener need to do the garage door lifting instead of the damages spring, and that what make it seem like theproblem is coming from the opener. But that is only option. One more option is that you have a problem with the garage door sensors, which make the door stop when it is closing, and reverse to open position, as you can read in our FAQ, page, there are few options for sensors problems, and few solutions for them. And eventually, there is always the option that the problem is coming from the motor itself. Now the big question which we are facing not once during our garage door service in Brooklyn is – “should I repair the motor, or should I replace it”? The answer for that depend on many parameters, which you can find our article about garage door motor in La Verne.Are you planning to repair your garage door by yourself? There few things you should know, whether it is a garage door repair in La Verne, an Overhead door in La Verne, or a Commercial garage door repair in La Verne: Overhead garage door can be dangerous, and should be repaired by a professional garage door technician. When we are searching the web for a do it yourself garage door repair, and we watch Videos on Youtube, it make us feel that it will be easy to repair our garage door in Brooklyn without the assistance of a trained garage door technician. What the Videos don’t tell you, is that there are few thing you should consider before you go ahead and purchase the parts that you need to fix the broken door? We would like to go over few things that you must ask yourself:As you can see, repairing a garage door by yourself is something that can be done, but at the same time can be dangerous. When you are watching the Videos on you tube, that explain how to repair a broken garage door, you are learning how to repair a certain problem at a certain garage door, but most chances are that your garage door is different, and it may require different techniques for the repair.There are many problems that can accrue while we are using our garage door. Being the largest moving object in our house, the garage door can weight hundreds of pounds, and when it is being used on a daily base, sometime few times a day, it is only a matter of time before the door will need some service such as repair or maintenance. From a safety sensor problem, to extension spring that snapped, through out of track, opener repair, broken pulley, broken roller, hit by a car, bended section and much more, it is almost impossible to determine what the problem is before examine the door. The best advice we can give, is whenever your garage door break, stop using it, and contact us for a same day garage door repair in La Verne.Important!!! If your garage door is broken, or if you think that there is something wrong with the way it is working, or if it is making strange noises, we highly advise you to stop using the door, and to contact a garage door repair in La Verne. Not only that using a broken garage door cause a bigger problem, but a broken garage door can be dangerous to you, and to those who come near it.If your garage door is making a strange noise, it probably mean that you did not perform the every 6 months maintenance for the garage door. There are few reasons for a noisy garage door: from rusty garage door parts, to an old spring or rollers which need to be replaced. In that case you need to repair or replace the damaged parts, and perform a general maintenance to the garage door, to avoid other problems in the future. The garage door maintenance isn’t complicated, and can be done by any trained garage door tech. Not only that the garage door maintenance is going to improve the way your garage door operate, the maintenance is a great opportunity to examine the garage door parts, and to ensure that the garage door is safe for use. For garage door maintenance in La Verne, please contact us, and we will gladly perform the maintenance for you.Sometimes a garage door is closing only half way, and then reversing to open position (In some openers, this problem is followed by a flickering light from the garage door motor, which tell you that there is something wrong), or doesn’t close at all. The problem may be in the garage doors sensors, or at the parts such as the spring. If it is the safety sensors, sometime it can be easily repaired, just by placing the sensor which moved back to the right position (in case the sensor was accidentally pushed). If the problem is within the mechanism of the garage door, the best thing for you to do will be to contact a garage door repairer, to come and solve the problem.If you garage door is out of the track, no matter what the reason is, we highly recommend you not to try and put it back yourself. There is a reason why the garage door is out of track, and if the problem will not be solved by a garage door technician, it will happen again, and might be dangerous! Even if you can push roller back into the track, it does not mean that you repaired the problem, and it most likely happen again in the future, and when it will happen again, not only that the damage may be bigger, but it can also be dangerous.A problem which seem like coming from the garage door opener, can often point to a different problem, such as a broken spring, or other garage door problem which require a repair. As we explain HERE, the opener only do small part of the garage door lifting, while the spring are doing the majority of the opening and closing, so if one of the springs, or another garage door part is broken, the door won’t work properly, and so will the opener, and it may seem to you like there is an opener problem when there is no opener problem, but other part which need repairs.Welcome to La Verne garage door company a premier garage door contractor to help with all of your garage door repair needs and most affordable price that can be found in La Verne area.Do you have broken spring? Ken Davidson Garage Doors helps you get what you want and how you want it. As a company specializing in garage door parts distribution and garage door repairs, we focus first on our client’s needs and wants. We believe that every business transaction should be conducted on a professional level, but this does not mean that we shouldn’t get up close and personal with our clients. Our team of garage door experts can visit you in your home to assist you with any garage door problems, or to help you plan out your future garage door. We never back down from any challenge, that’s why we welcome all clients. We have clients who would like to do a hands-off approach on their garage door, and choose to have all maintenance and customization matters delegated to us. We also have clients who would like to know the nitty-gritty behind garage door repair, so we educate them on how the garage door operates, as well as what could go wrong in the complex mechanism. Our dedication extends beyond mere garage door acquisition, because we believe that each client should enjoy total security and satisfaction when it comes to garage door matters. Contact us today and find out for yourself why we are regarded as pioneers and game-changers in the garage door market.Garage door services are very much in demand nowadays. More car owners are becoming aware of the security and car maintenance benefits brought about by garage door installation. However, you can’t just rush headlong to the nearest garage door shop and choose just a random garage door on a whim. You’ll need to be properly informed on technical stuff which will help you determine the size and type of garage door you want to install in your home.We at Ken Davidson Garage Doors can help you out when it comes to planning out your ideal garage door. First, you have to consider whether your garage door is for residential or commercial use. There are important distinctions between these two types of garage doors. Second, you’ll have to choose what the garage door panel will be made of. Do you prefer it to be mostly steel, or mostly wood?Or do you want it to be a mix of steel, aluminum, or wood? Would you prefer to put in some fiberglass components for a high-end look? You’ll also have to decide on the color and design of your garage door. While a garage door is made with a primary purpose in mind- to protect your car- it should also have some aesthetic value to complement the overall design of your house. Third, you’ll have to decide how your garage door operates based on the inner mechanism. Do you want it to open slowly, with minimal noise? Or do you want it to open in a jiffy, and don’t mind even if it’s a bit clunky? You’ll also come across garage doors that are akin to high-tech devices. Ken Davidson Garage Doors provides high-end services such as garage door alarm installation, motion sensor installation, CCTV camera system, and remote-control garage door openers. There are even garage doors that can be opened only by keying in a password, or by accessing it via a laptop or mobile phone.You can even ask for a free estimate that will help you determine how much your ideal garage door would cost. We put a premium on customer satisfaction, so you won’t have to worry about getting lost amidst technical specifications and monetary figures our garage door experts will be beside you while you build your garage door from scratch. Jump-start the construction of your garage door today. It’s never too late to provide your car with top-notch protection from Ken Davidson Garage Doors.Have you ever wondered how your home would look if you installed a garage door which not only works well, but goes easy on the eyes? Ever envied your friends who own sturdy yet classy-looking garage doors? Give yourself a break and contact Ken Davidson Garage Doors and tell us your aesthetic preferences. We’ll give you a free estimate on how your ideal garage door will cost. And don’t worry;we won’t make you stick with only one option. Ken Davidson Garage Doors has a wide range of garage door materials that can be customized to fit your needs. It doesn’t matter if you own a modest house or a mansion, our experts will take care of size selection details for you. When it comes to door panel and window options, you’ll have complete freedom to choose what suits your taste. You get to dictate what your ideal garage door is comprised of. Whether it’s wood, steel, or any other sturdy carriage, Ken Davidson Garage Doors will surely deliver. New garage doors can enhance the appeal and value of your home and provide you with increased comfort, convenience, safety and security. Call now for professional assistance in making a choice on your garage door. Do you have a challenging project? Client Confidentiality is of course totally assured. We have the engineering and installation capability to handle any specialty door project you may have. Choosing one of our sectional garage doors creates a stylish feature that is sure to enhance not only the look of your home but also the security and improving insulation. With a variety of styles, colors and finishes available, you are sure to find the right sectional garage door for you. The sectional design makes the most of your driveway and garage. Vertical operation ensures you can park right up to your door and utilize your entire driveway. Headroom requirements are minimal with as little as 110mm needed with our low headroom motorized operation mechanism. install your door. By carefully listening to your needs we will find the garage door to perfectly suit your home. The ideal standard specification is remote controlled electric operation for maximum convenience and ease of use, but easy manual operation is available.